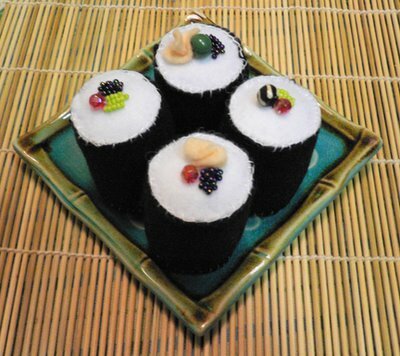 Okay, I admit it, these aren't real sushi rolls... I made them using felt, beads and stuffing. My new kick is making food art (it's been done before, a lot, but it's still fun)! Sushi rolls are great to eat and not hard to make, all you need is a bamboo mat made for rolling them (pictured under the dish). Choose from the lists below, according to your dosha, for filling ideas. To make the rolls, lay out your bamboo mat with the sticks lying horizontally. Lay a sheet of nori in the middle, and spread a thin layer of cooked grains all over, leaving 1 inch free at the top. In the center, make a row of stuffing ingredients that's not too thick. If you like, sprinkle crushed toasted sesame seeds overtop, drizzle with toasted sesame oil, or dot with pieces of pickled ginger. Start rolling the nori from the bottom up, lifting the bamboo mat to help you along. At the end, squeeze the sushi roll in the bamboo mat all along to compact it. Place roll on a cutting board and slice into 6 or 8 pieces. Ta-da! Combine 1/4 cup tamari (or soy sauce), 1 Tbsp toasted sesame oil, 1 Tbsp crushed toasted sesame seeds, 1 pinch to 1 tsp crushed chili flakes, 1 minced garlic clove, and 2 tsp minced green onion. Kaphas use Bragg's and reduce sesame oil to 1 tsp. Pittas omit garlic, chili and green onion, and stay away from wasabi! your blog is beautiful! and so is your sushi - both the edible and non-edible! my gmail shows headlines, and i've added your blog to them, so i'll know when you've updated! i loved the valentine too! Yum! I want those sushi now!